The recent, and unprecedented, canonization by Pope Francis of a husband and wife, Louis and Zelie Martin, the Parents of Saint Therese, has stirred a great interest in this extraordinary family. This work, by the highly regarded expert on the Martin family, Father Stephane-Joseph Piat, O.F.M, is the definitive biography, Story of a Soul, how important her family life was in setting the foundation for her spiritual life. She grew up in a close family, where the deep love of parents and children for God, neighbor, and each other was the very heart of their home and family life. 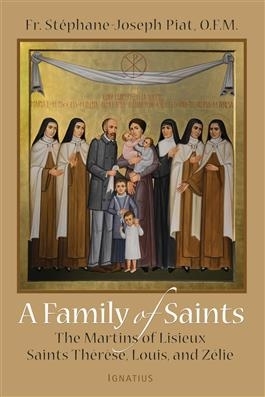 This family of saints, who lived in the late 1800s and early 1900s, might appear from their quaint photographs to have lived a relatively serene and smooth path to sainthood, untarnished by modern problems. But, as this book shows, the reality is quite the opposite. They suffered from the loss of four children, the failure of a family business, and the death of Zelie, at forty-five, to breast cancer. The secret to their happiness then is the secret to our happieness now-unfailing love made possible by boundless faith in God. All the challenges the Martins faced, great and small, were met with a profound trust in Divine Providence.